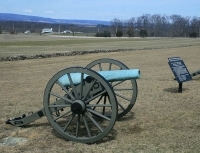 The small town of Gettysburg in Adam's County, south central Pennsylvania, was the site of the largest battle in the American Civil War. It was the inspiration for Abraham Lincoln's celebrated Gettysburg Address. The Battle of Gettysburg started on 1 July 1863, lasting two days and resulting in a Union victory. The Gettysburg National Military Park stands testimony to the battle, incorporating about 6,000 acres of land, 26 miles of park roads, and more than 1,400 monuments, markers, and memorials. One of the most famous military encounters in US history, the Battle of Gettysburg has been immortalised in many books, paintings, poems, and movies. The town is now a pilgrimage of a sort for military history buffs and anybody interested in the Civil War and Abraham Lincoln.